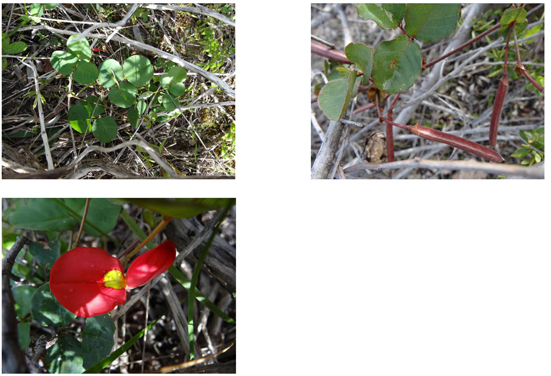 Running Postman is a common, sun-loving ground cover around Cape Jervis. They like sandy soil, and are drought tolerant plants, so look for them off Flinders Drive, towards the Ferry Terminal. The wiry stems spread along the ground for up to 1.5 metres. Leaves occur in threes, and have wavy edges. The lovely red flowers occur singly or in pairs, in spring. Note the yellow spot at the centre. The seed pods are like long pea pods, but are dark red. They can be up to 5 cm long.